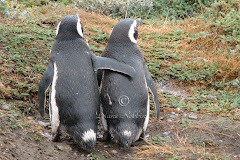 A highlight of our Antarctica trip was being able to go ashore and see the wildlife up close. As we investigated various cruise lines, one important distinguishing feature was whether or not we had to bring our own boots for the time on land. Getting boots is no big deal. Most people I communicated with over various forums and bulletin boards simply bought inexpensive ‘Wellingtons’ at Wal-Mart, and then, at the end of the cruise, left them behind. But I didn’t even want to do that. The money wasn’t the issue. The concern was suitcase space. Whenever possible my husband and I travel with only carry-on luggage and we wanted our trip to Antarctica to be no different. It worked out nicely that the cruise line we were most interested in booking also provided boots. In the pre-cruise information we were told to bring heavy wool socks to wear in the boots. How it worked from there we had no idea until we were getting ready for our first trip to the shore. Our ship had 333 passengers. 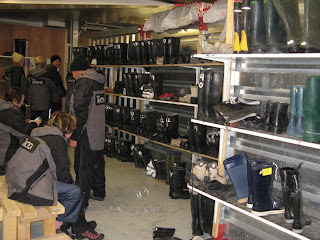 We were divided into groups and when our group number was called we headed to the ‘boot room’. This room had shelves and shelves of boots, all lined up with their (European) size painted on the outside. We found our size and then sat on one of the benches to change out of our sneakers, into the boots. Our sneakers were then placed on the now empty spot on the shelf to await our return. 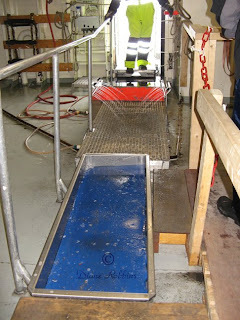 Then, before we boarded the small boat to go ashore, we walked through three cleansing stations, an attempt to prevent transporting anything on the boots from one landing to the next. We had a pan that had bristles on the bottom to scrape the bottom of our boots. There was a spray that cleansed the sides of the boots. And there was a third pan of liquid for further cleansing. For all of our Antarctic landings, all three had to be walked through as we both disembarked and reboarded the ship.